Our rod locking systems operate with traditional round or new flat rod designs sited within the door gasket area where they enable multi-point closure for optimal gasket pull-down. They can help in achieving IP65 levels or higher if matched with a suitable lock mechanism from EMKA’s modular program of swinghandles, quarter-turns and traditional L/T handles. 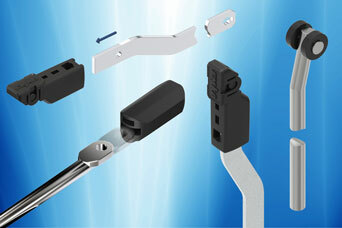 Round and flat rods are quickly installed by use of easy clip-in rod guides. Typically round rod systems enable 2 or 3 point closure, whereas a flat rod design incorporates the possibility of additional closure points along their length which is especially useful on very tall cabinets. Share the post "Rod Lock systems maximise cabinet sealing and door utility"